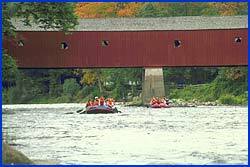 The famous Covered Bridge in West Cornwall marks the halfway point and is a nice spot for a picnic lunch (no glass bottles please! ), or stop at one of the many scenic spots along the river. Our vans leave our shop to bring you to the river at the following times ONLY! PLEASE ARRIVE 20-30 MINUTES PRIOR to shuttle departure. Pickups are every 1/2 hour throughout the afternoon.